"Sampath Speaking" - the thoughts of an Insurer from Thiruvallikkeni: Vaseline Lever accuses Bishan Bedi of stirring up and Chepauk fans as orchestrating !!!! Vaseline Lever accuses Bishan Bedi of stirring up and Chepauk fans as orchestrating !!!! In that Test no. 793, England opened with Dennis Amiss and Bob Woolmer who was born in Kanpur and later died in Jamaica mysteriously during WC 2007, when he was the coach of Pakistan. Tony Greig was the captain- John Brearly, Roger Tolchard, Derek Randall, Alan Knott, John Lever, Chris Old, Bob Willis and Derek Underwood played and were all out for 262. Bishan Bedi took 4; Madanlal and Prasanna 2 apiece. India could muster only 164 – Lever took 5/59. England were bowled out for 185 [Chandra took 5/50; Prasanna 4/55] and chasing 284, Indians were bundled out for 83 – Willis 3/18 and Underwood 4/28 inflicting the damage. Today’s ESPN Cricinfo carries an interview with that John Lever who speaks of his sharing a room with Randall in Pakistan – not being easy at all. Says that he thought 8 balls per over could have worked in England, but not in hotter countries. Writes about touring India and how difficult to survive without breaking down. That Indian balls swung around more than the ones in UK. Many Cricketers have interesting stories to tell after retirement, not many are taken seriously. Not Brad Haddin though ! – Haddin says he has no regrets about the way his Test career ended, when he was not reinstated after stepping down from the Lord's Test to be with his ill daughter. That decision effectively spelled the end of Haddin's days as an Australia player, and on Wednesday he confirmed that he was now officially retired from international cricket. While it was fully expected that Haddin, 37, would depart after the Ashes tour, it had appeared likely when the campaign began that he would remain the incumbent gloveman throughout. However, he withdrew from the second Test at Lord's to be with his four-year-old daughter Mia, who was receiving treatment in a London hospital. Mia had been diagnosed with a rare form of cancer when she was only 17 months old, and Haddin had missed the 2012 tour of the West Indies to remain home with his family at the time. In announcing his retirement at the SCG, Haddin said he had no regrets about his decisions and knew that he was unlikely to be recalled after standing down during the Ashes. One feels sorry for Mia and appreciate Haddin, the family man. Now this is what Lever has to say about the infamous incident that he was involved in India, that came out at Chepauk, but was buried more because of diplomatic pressure than its merits !! I think Bishan Bedi stirred things up in Chennai. Little lines like, "I've never seen him swing it this much in England." When we headed south, where it was a lot hotter, I'd asked our physio for some Vaseline to stop the sweat going in my eyes. Dear old Bernard Thomas didn't have any. 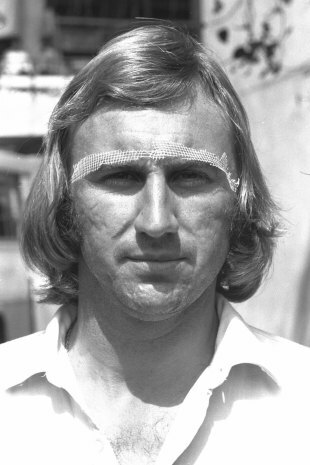 The stuff that he gave us - these strips for our foreheads - he'd bought in India two days before that match. The Indians said: "We caught him cheating here, but he probably used it in Delhi." None of that was true, but we were greeted the next morning with these big banners: "Cheater Lever go home." It looked quite orchestrated. While Lever can try to defend his ‘none-so-acceptable’ act blaming physio and self innocently using the sweat with Vaseline – he must read back the real facts, especially when he outrageously maligns Indians [knowledgeable cricket lovers of Chepauk] that it was orchestrated. Unfair Lever, those were the days of little technology but lots of Cricketing knowledge. Lever, Englishmen and the whole Cricketing fraternity knows that he played 21 Tests took 73 wickets in all but never performed anywhere closer to his debut Test and series. It swing bowling was an art and he could do it so well in India, why the ball never swung such in his own place in much more favourable circumstances ! – will he ever explain ? He must read what Tony Greig had to say of that Vaseline incident : - In his wisdom, our physiotherapist decided that he should do what marathon runners do, that is put some Vaseline-impregnated gauze into the eyebrows of the bowlers. By doing so, it would channel the sweat down the side of the eye, as opposed to allowing it to go into the eyes. Well, I can tell you that it was a very silly thing to do because under the laws of the game, if you introduce a foreign substance onto the ball it is clearly cheating. What happened was that John Lever had a habit of taking sweat from him brow, which is perfectly legitimate as long as it is only sweat. However, he did mix the Vaseline-impregnated gauze with some of the sweat on his brow, because he had this habit of going straight across his brow. So, purely by accident, he found himself with a slippery hand and, as a result of that, he decided to get rid of that gauze. He took it off his eyes and put it down at the base of the stumps in front of the umpire. This was picked up by the umpire, who recognised that it was a foreign substance, and of course that's how it got out of control. There is absolutely no doubt in my mind that this was an inadvertent mistake by our physiotherapist ! Statistics reveal that out of his 73 test wickets in 21; 26 came in first 5 in that debut series !!! ~ was that poetic justice, he played his last Test against India at Leeds in 1986 when India won by massive 279 runs.